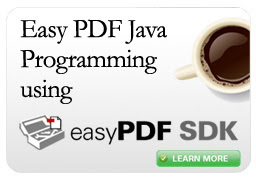 We have put together resources on how to program PDF applications in Java using BCL easyPDF SDK. BCL's easyPDF SDK is a full function development system that will allow you to create PDF, process and manipulate PDF, raster PDF, and process PDF form fields. Try BCL easyPDF SDK now for free by downloading the free trial.